To develop players or to win the USL Cup, that is the question. More specifically, it’s the question that everyone has been asking Brendan Burke and Bethlehem Steel FC this season. Now that the Steel have advanced to their second playoff game, it’s a fair question to ask. It’s also one that of course, has a couple different answers. The idea has always been that Bethlehem develops players for the first team, then focuses on the club’s record. Well, with a different starting lineup 98% of the time, Burke seems to constantly be testing his many players, allowing them to gain experience. As the team trends younger, the development first aspect really seems to be more and more prevalent. The Steel’s goals this year were to pretty much just be better than last year according to the captain. In 2017, the Steel finished in 17th place overall, with 44 points. This year, they finished in 14th place overall, with 50 points. In fact, this season has been Bethlehem’s best season yet, improving every year since 2016. Safe to say that they accomplished their first goal. Last year marked the Steel’s very first playoff game. They lost against Louisville, but it gave the club and the players their first taste. With Bethlehem’s shoot-out win against Pittsburgh last Saturday, the Steel improved their playoff record to 1-1 and checked off their second goal. If those are really the only two, or at least the primary two goals for the team this season, then it seems like the focus is on developing the team. Winning is always something teams strive for, so it’s not surprising that Bethlehem wants to hoist the Cup. The excitement is palpable for the Steel, the players and even the coach himself want to win. No, Chambers did not mention winning the Cup as one of the teams goals, but he did say that the Steel is still hungry. “There is no point in wanting to be here and that be enough,” Chambers said. “We aren’t satisfied with winning just one game.” One playoff win won’t cut it now that they’ve experienced a win. 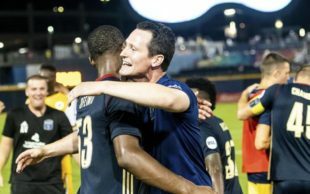 Burke said that the win against Pittsburgh has “definitely left us excited for more now that we’ve had a taste of it” as the club prepares for the re-match against Louisville. With the club’s current drive and momentum, it seems like Bethlehem’s focus is on winning the USL Cup. This has always been the answer to the question. Burke has always said it’s develop and win. To properly develop a strong, experienced player, they need experience in high-stakes games. To get experience in high-stakes games, the team needs to win. Burke’s point every season is that both can and must be done at the same time. The record shows that focusing on both player development and winning has been fairly successful in the club’s short history. Every season younger players get more playing time, and the Steel gets better results. The Union are seeing more and more strong players, developed by Burke at Bethlehem, while the Steel advance further into the playoffs every season. This year, Bethlehem is hoping to win the USL Cup with their developing, young stars because that’s the point of every season. IMO part of individual development is collectively learning to win – setting expectations high, maintain hunger, welcome pressure, etc. Developing whilst winning means a pipeline of talented kids to the first team who expect (and will do what it takes) to lift trophies once they get there.